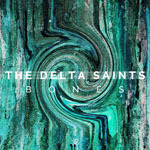 Share the post "Album review: THE DELTA SAINTS – Bones"
Nashville-based The Delta Saints’ new album Bones, strips the band’s roots/blues sound down to its essence, blending rock ‘n’ roll, country, R&B, soul and gospel, exploring territory not unfamiliar with that trodden by the likes of Jack White, The Black Keys, Band of Horses and Led Zeppelin. Recorded at Nashville’s Sputnik Sound studios, producer/engineer/mixer Eddie Spear (Jack White, Arctic Monkeys, Neil Young) spreads a ghostly, psychedelic canvas, on which the band paint a soulful groove that has the swagger of Rival Sons and the spatial awareness of Kings Of Leon. Being a Southern band, ‘classic’ Southern guitars abound paired with stirring Hammond B-3 riffs making Bones a real ‘throwback’, sounding fresh and organic – partially, the result of spontaneous song writing in the studio capturing the immediacy and rawness of the creative process. Frankly, it’s hard to believe that Bones is only their second album, and while I’m not familiar with their debut release Death Letter Jubilee (2013) a listen to online snippets would suggest they’ve really upped their game for this sophomore release. As a band, they’ve been around since 2007, but originally had no plans to record, with just a couple of EPs preceded their debut. But they’ve been building a following around the globe having toured Europe a total of six times, playing more than 200 shows in Spain, Sweden, France, Switzerland and Germany, as well as several festivals in Holland, Belgium and Germany. This entry was posted in ALBUM REVIEWS, ALBUM REVIEWS (Mobile), All Posts and tagged album, Bones, review, rock, southern rock, The Delta Saints. Bookmark the permalink.